Sound AND look just like the infamous Sith Lord by adding this amazing, electronic breathing box to your Darth Vader costume! 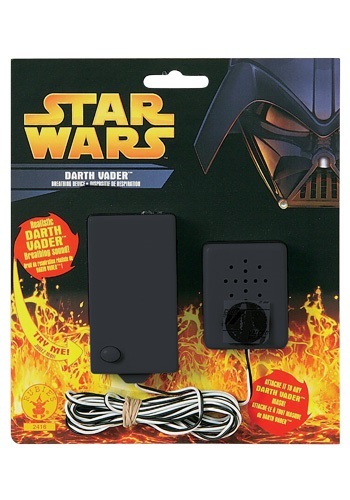 Includes 2 pieces: a small speaker (less than 2" x 2" x 1/2") which can be attached to a Darth Vader mask, and a hand-held button to trigger the breathing effect. Both pieces are connected by a wire long enough to stretch from the mask to your hand while staying almost entirely invisible. Browse our accessories to unearth a Darth Vader lightsaber to make your costume complete.